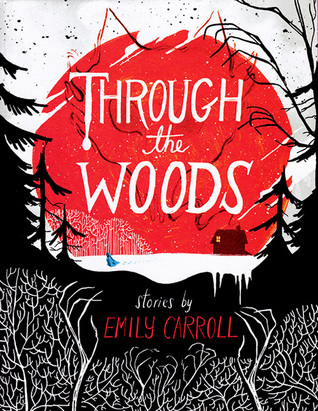 Through the Woods by Emily Carroll. Margaret K. McElderry Books, 2014. Hardcover. 208 pages. This is, hands down, a book that I will come back to many times to reread over and over. I received this book as a gift a few months ago and had yet to dive in, but I've been in a little bit a slump - what with university and other books I've been reading - and I knew I wanted something refreshing, short, and captivating. Through the Woods delivered all of those things and added more than I imagined. Through the Woods contains a few relatively short, quick stories, but they have so many layers and so much depth that I truly feel like I would never get tired of them. These tales are all undeniably beautiful, haunting, and spine-tingling. Emily Carroll is a master at telling stories that say a great deal in very few words. The images contribute wonderfully and convey just as much as each word, causing both elements work hand-in-hand. This book is mystifying, beautiful, terrifying, and captivating. I'm not so sure I would recommend reading it at night (unless you're into feeling terrified alone in the dark). Though to be honest, I feel like this would be so much fun to read on a stormy night with some soft lighting (or candles) either by yourself or reading aloud with a few friends or family members. That would bring this book to a whole other level... but I digress. The pages and illustrations are gorgeous. I love the glossy pages with colors so vibrant you feel like you're holding a much more expensive book in your hands. (I felt overwhelmed with how beautiful it is.) The colors are so vibrant and have a wonderfully haunting quality due to their vibrant hues - the reds and blacks dominate and draw attention to the most captivating parts of each image. It's truly a masterpiece. Overall, Through the Woods will be receiving a very ecstatic five stars. Go read it! I love that cover LOVE IT, I can see myself getting totally into this if the art is this good.